Hip-hop’s storied history of “making it rain” - throwing fistfuls of cash into the air in a public venue in order to make a declarative statement about one’s extravagant, inexhaustible wealth - appears to be on the wane. Despite Gucci Mane’s recent insistence that he and his crew throw money “like we mad at the ceiling” and a confused Jim Jones naming his latest mediocre effort Prey IV Reign, the drought is apparently over and rain sticks being put away. “Niggas still makin’ it rain, and we off that,” Timbaland admonished, several weeks ago, on “Off That” from Jay-Z’s Blueprint 3. Producer/singer The-Dream joined the debate on a lament-strewn Love vs. Money cut: “I can’t even hate the homie/I am to blame/Instead of loving her, I was making it rain.” But we had some lingering questions about the practice, and because we don’t know any ballers, shot-callers, or rappers personally - let alone any who regularly make it rain - we figured we’d pose them here in the hopes that our readers could answer them or maybe pass them along to somebody who can. 1. When you’re preparing to go out for the evening, do you specifically designate a certain amount of money as “making-it-rain money,” in the same way one wad of greenbacks might be “stripper-tip money” or another might serve as “buying-out-the-bar money,” or is it all the same to you? 2. What happens immediately after the money is thrown? Do you - or an underling, perhaps - gather it up? Or can other people fight for it? Let’s say, hypothetically, you were hurling $100 bills, and some of those bills fell - sorry, rained - into a puddle of puke. Would you demand that paper back? 3. When you’re making it rain, do you throw all big bills, like $100s or $50s? Or do you cheat a little, throwing a couple big bills with a bunch of $5s and $10s? 4. Is there a gentleman’s rule about simultaneous rain storms? 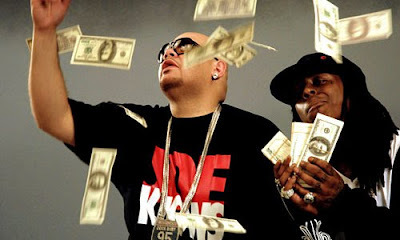 By this I mean, is it customary for rappers to take turns making it rain? It should be, right? Because that would cut back on disagreements about whose storm front was more formidable or dope or what have you. 5. Have you ever hired a professional counterfeiter to fabricate currency for the express purpose of this sort of showing out, only to have someone with intimate knowledge of U.S. legal tender - like an off-duty Treasury agent, maybe - pick up one or two at the spot where you’re throwing Benjamins and call you out on it while you’re hoisting a chalice of expensive champagne with your entourage? If so, how do you come back from something like that?